April 27th and 28th 2019. Gates open at 6am, trading from 6.30. Cars cost £10, vans £15. Parking £1, food, tea and Coffee available. Whitstable and Herne Bay Lions Club was chartered in 1971. We are a family of volunteers raising money for individuals, families and organisations in need. Each year we raise between £15,000 and £20,000 by a wide variety of events including May Day at Whitstable Castle, Boot Fairs, Fashion Shows, Quizzes, Car Parking, and collections at supermarkets and Christmas at Canterbury Garden Centre. About 85% of the money raised is distributed locally with the balance going to Lions projects nationally and internationally. We meet twice a month at the Parish Social Centre, Church Rd, CT5 2DY on the 1st and 3rd Thursday of the month at 7.30pm. We are always looking for new members and welcome men and women from all areas of the community regardless of race or religion. 0845 numbers are charged at 7p per minute. Please note that if you ring our 0845 number from a mobile phone you may pay an access/Service charge from your provider (source Offcom) which may be up to 36p a minute. Whitstable and Herne Bay Lions Club do not benefit financially from any call. 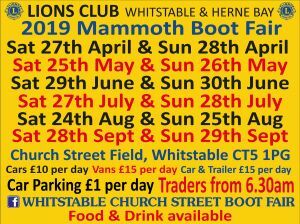 Copyright © 2016 - 2019 Whitstable and Herne Bay Lions Club. All rights reserved.